To study the data transmission using neuronal circuits. Neurons are excitable cells that use a combination of electrical and chemical signals to rapidly transmit information throughout the body. The cell body, dendrites and axon of a neuronal cell plays an important role in cell signaling. 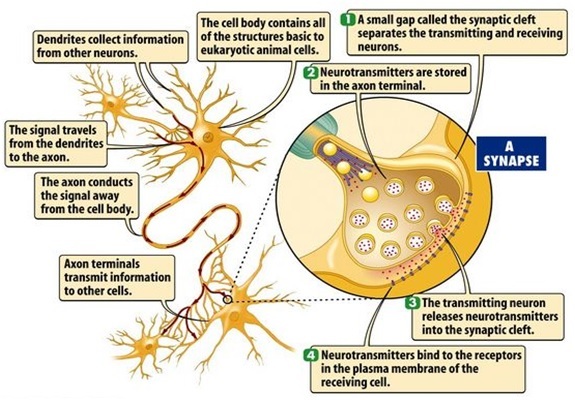 The neurons transmit signals by two ways: intracellular signaling (communication within the cell) and intercellular signaling (communication between cells). The long distance communication of signals is done by sending electrical signals (action potentials) along the axons. The communication between neurons can be done by sending chemical signals (neurotransmitters) through the synaptic junctions and is called the process of neurotransmission. Action potentials are the electrical signals that generated at the axonal end of a neuron. It is generated by the diffusion of ions across the neuronal membrane. Action potentials have mainly three phases: a depolarization phase, a replorization phase and an after-hyper polarization phase (Figure 1). Ions are the electrically charged particles. The neuronal cell contains a protein membrane which acts as a barrier to the ions and allows the diffusion of ions across the membrane. That is, the ions are able to move across the membrane when the ion channel opens and it is closed due to the presence of neurotransmitter. The difference in the ionic concentration inside the neuronal cell body makes a change in the electrical property of membrane itself. Thus the membrane is said to be polarized when its potential becomes -70millivolts.The influx and out flux of ions through ion channels gives the target neurons a positive charge, hence it is said to be depolarized. When the depolarization reaches a point of threshold level, a large amount of electrical signal known as action potential is generated. This action potential travels along the axon quickly at a rate of 150meter/second. The process of conduction ends at axon terminal of neuron where the intracellular signaling begins. Neurotransmission is the process of transmitting signals from one neuron to another via synaptic junctions in the form of chemical signal (neurotransmitter) or electrical signals. The function of interneuron is to receive inputs from other neurons through synapses and processes that information and sends it as output to other neurons via synapses. Thus it forms a network known as neural networks. The information flows through the neurons via electrical synapses or chemical synapses (Figure 2). The transformation of information between two neurons occurs at electrical synapses. At electrical synapses, two neurons are physically connected to one another through gap junctions. The changes in the electrical properties of gap allow the transmission of signal from one to another and vice versa. Thus these two neurons act as a single neuron. The transformation of signals between two neurons occurs at the chemical synapses. The synaptic cleft between presynaptic and postsynaptic neurons is filled with an extracellular fluid which creates a physical barrier for the electrical signal. The signals are transferred from one neuron to another through this fluid. In terms of electrical the cleft is considered as a short in an electrical circuit. The function of a neurotransmitter is to overcome these electrical short. Thus the neurotransmitter act as a chemical messenger and brings a connection between the action potential of one neuron with a synaptic potential of another. In biophysics of mechanisms, two most explored mechanisms include membrane transport and electrical excitability. This lab experiment shows how to understand electrical excitablity and its variations when more than one "excitable" component is seen. Biological membranes are electrical insulators due to their phospholipid bilayer structure. These membranes are impermeable to ions unless specific ion channels are open. The presence of different ions in the cell makes its own ion gradient which contributes a charge separartion in the cell. The ion gradient across the cell membrane makes the ion to pass through it and contributes an actual membrane potential. Most of the cells have a potential around -40 to -80mV indicating that they are dominated by K or Cl permeability. Ion gradients can be mimicked, manipulated, and measured by electrodes attached to current generators and volt meters. Electrophysiology is an experiment done by modeling membranes as electrical circuits with resistance, capacitance, and charge (as in a battery) and correlated this circuit elements with structural features of cell membranes. From membrane potential (E) and membrane currents(I) ,we can calculate resistance (R) or its inverse the conductance (g) and permeability ratios. Ohms law describes the relationship between these parameters. To understand the basic concepts of neuronal microcircuit, refer the following experiments. In previous sections, we address the basic functioning of neurons (refer Neurophysiology Virtual Lab) and synapses that together form the neuronal microcircuits. Neuronal microcuit is a network of biological neurons. In neuroscience, a biological neural network is a series of interconnected neurons. Artificial neurons networks mimic the biological neural network. In previous labs we have seen analog neurons and its properties like light seeking characters. Here we are describing how analog neural network transfer data. This is a micro core version. ie a nervous neurons configured in a simple loop topology. This configuration is also known as a Nv Core or Very Slow Propagation artificial neural systems. Figure.3 shows six Nv neurons using a 74HC14 invertor IC . In Figure 4, each circle represents each Nv net. Green color represents active Nv net. ie., one bit is present in that particular Nv net. In the circuits each neuron is represented by LEDs. Initially when we give power to the circuit all neurons will fire at maximum rate. This state is known as saturate state. Saturation is the natural power-on state. At this state there is maximum of 3 processes or three bits in the network at any one time as shown in Figure1. This is indicated by LED light. So there will never be two adjacent LEDs on at the same time. Next we will remove one process.ie one bit from the data. For this we use a Process Neutralization circuit (PNC). 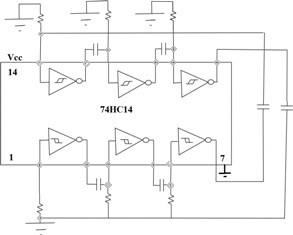 PNC circuit make includes a switch to short out one of the input bias resistors as shown in the Figure 5. Closing this switch destroys any passing process. If we hold it long enough and all processes are destroyed. 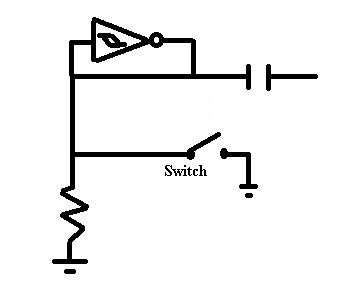 By holding the switch closed for approximately for 2 seconds we get a two process state as shown in Figure 6. This state can be useful in some cases but in the case of a simple walker its not much use. Below is the null state .This state is a Nv net at rest.